Conscious Skincare Grapefruit Lemon and Cedarwood Body Polish & Body Butter. Grapefruit Lemon and Cedarwood Body Polish & Grapefruit Lemon and Cedarwood Body Butter complement each other well, not to be said that you cannot mix and match others from the range but for me, I enjoy the scent one after the next once I’ve left the shower. Very uplifting. The body polish contains fair trade Organic Sugar and Organic Glycerin that helps to gently and effectively lift dirt & remove dead skin to leave smoother and cleaner skin. I love a good sugar scrub, due to the glycerine with the Grapefruit Lemon and Cedarwood Body Polish, which is noticeable within the tin, it’s hydrating but also it’s a humectant meaning it attracts and locks in moisture, your new smooth skin will be moisturised and protected. Grapefruit essential oil, cleanses, tones and supports healthy looking skin. Lemon essential oil has astringent and detoxifying properties, rejuvenating tired or dull looking skin but also assists in balancing skin by reducing excessive oil levels, it helps reduces the skins pore size by being an effective skin toner. Cedarwood essential oil, can promote healthy & clear skin with a calming affect with astringent properties it’ll benefit muscle and skin tone. Now while both of them contain these oils the Grapefruit Lemon and Cedarwood Body Butter which is whipped into a souffle texture this contains organic fair trade Shea butter & organic Cocoa butter are intensive moisturisers, both of which I love and use them raw on my skin from time to time, nothing better. They're amazing to help irritated, dry skin - neither do I have but if you do, these butters are gorgeous, they leave the skin baby soft and with a healthy sheen. Also organic virgin coconut oil & organic sunflower oil, rich in Vitamin E, regenerates skin cells, making it great for skin with pigmentation, giving an even skin tone. The body butter is soft, melt as it touches the skin and absorbs with ease. As October started to creep in, the temperature has dropped and it's certainly chilly, making these an ideal product to help keep the skin clear, smooth, moisturised & protected. Do you have a favourite bodycare product right now? This range sounds lovely! I am trying to find a range at the moment that doesnt irritate my skin so will give this a try! I love the Conscious Skincare brand they have some amazing products. Me too, I'm crazy for citrus. I know!! Definitely do, they've got amazing products. This lemon, cedarwood and grapefruit body polish/scrub looks absolutely lush. I am living for it. Doesn't it. Full of sugar and oil, moisturising the skin as it exfoliates. These will definitely be helpful as the temperatures begin to drop. The body polish sounds effective and good for the skin! Totally agree with that, need a more hydrating scrub for this time of the year. It's such a comforting and uplifting scent. This has coconut oil within the ingredients so you'll probably like this. 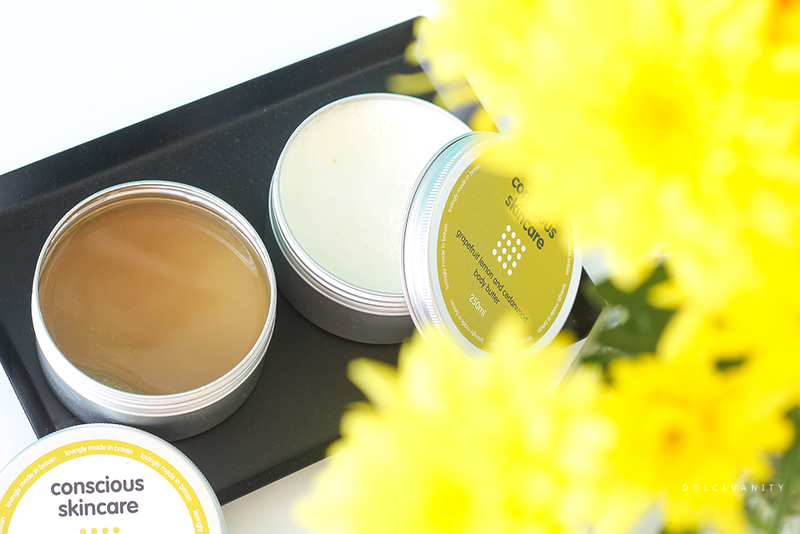 My favourite body butters all have citrus scents, I love the freshness of them. This sounds like one I need to investigate. I know exactly what you mean, I am the same. I hope you do! These sounds gorgeous and so refreshing!!! I love the sound of the polish! Very refreshing. Certainly a must have for the bathroom. Oh I wish I could smell through my screen - This combination of flavours sounds incredible. I must remember to look after my skin better this winter! Yes, I need to up the moisturising for something more rich for this time of year, hate that dry skin feeling. I love grapefruit scented products so these would be perfect for me - the scent combo sounds amazing! Oh yes bodycare is just as important in my books. Head to toe daily pampering lol. It's such a lovely company! I agree, it's a winning combination. I've not tried a sugar scrub yet, this sounds like it would smell amazing and keep my skin feeling soft and hydrated. Yes and you can even sit it from within the tin, all the liquid extremely hydrating and silky. I love the idea of the ingredients in this, I bet they sell gorgeous. Me too, I love a good scrub and it's always better when it smells good. This combo sounds perfect for autumn and winter when your skin needs a good exfoliation but also needs to keep its moisture. The scents sound amazing too. Totally, it's exactly that. It's a perfect combination - the scent ahh I adore it. Haha! It's a good 'un. These products look fabulous! I have so many products but the one thing I am really loving is bath oils at the moment. Oh baht oils, I need some good bath oils at the moment. Can't fault bath oils. What lovely range I love the combination of grapefruit nad lemon , it must smell very refreshing. Yes it does and refreshing is what I need all the time lol it's uplifting. Love your picture and these body products sound absolutely amazing - loving the combination of scents they've used. Thank you very much. Me too, smells heavenly.